There have been many little Christmas books I've enjoyed over the years. My husband and I always make time with our girls to read through one of three very special Advent adventure stories as part of our Bible devotional time each December; we usually finish the last page of the devotional on Christmas morning...before we open Christmas gifts! 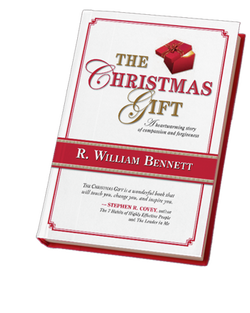 Last week, I was sent a brand new book by R. William Bennett (not the Dr. William Bennett with whom you may be familiar), called The Christmas Gift. It is a smaller book in size, so I knew that I'd be able to read this quickly and tell you about it. However, what I didn't realize was that I'd end up being the last member of the family to read it! The girls asked me what came in the mail, and when they saw that it was "just" another book to review, they didn't act overly excited about it. However, by that evening, Kelsi had read and finished the book. It may have helped that she was ill with something, and the book had been sitting near the couch where she resided all day. Within a couple of days, Brittany had read the book, unbeknownst to me. She's a picky reader, so there are far fewer books she'll start and actually finish. However, this book was finished quickly by her as well! Then, on Day 4 of having The Christmas Gift in our home, my husband asked me where "that Christmas book" was. Hmm. He acted nonchalant about it, but he had obviously been reading it already and wanted to finish it. This week, it was finally my turn to read the now much-treasured book! It took me about an hour to read The Christmas Gift, and I'll readily admit that tears stung my eyes more than once. From the look in my children's and husband's eyes after they finished reading it, I knew that they, too, felt the same way I did. I guarantee that unless you have a heart made of stone, The Christmas Gift will have a deep impact on the way you think about others and how you treat others. The main theme in this book describes how I've tried to live my life the last 15 years or so. Sometimes, it has been taken well by others, and sometimes it hasn't. The Christmas Gift is all about forgiveness, and how extending forgiveness to others can radically change their lives. This is how I've sincerely tried to live my life, not to necessarily make an excuse for someone's poor behavior, but to at least attempt to understand what may have caused them to react in that particular manner. The Christmas Gift also shows us the vital importance of having a heart of forgiveness and being willing to go to someone whom we have wronged, to offer forgiveness to them. Forgiveness brings healing to our own souls. When we choose to swallow the awful pill of bitterness, we are the only person who suffers greatly from refusing to forgive another person. From my past experiences, when I've extended forgiveness to another person, it hasn't always been received in the way I had hoped. Most people will embrace my apology with open arms and a sincere smile, drawing us together in a deeper friendship and love for each other. However, a few people have become more distant, and our friendship has withered or become less personal. No matter how my apology or act of forgiveness has been accepted, I know that I have done the right thing to offer it. I know that the burden of wrongdoing is no longer on my own back, and the peacemaking between the two of us is now up to them to continue or reject. With that out of my hands, I can relax and sleep well at night. Mr. Bennett has portrayed these deep principles of godly living in a way that any child, ages 8 or older, can understand. We will read this book again and again, and maybe some day we will learn that a movie has been made from the story. It would be well worth watching! This is a simple Christmas story I hope will touch your heart. My family and I love to read stories at Christmas. Our favorites focus on the small, everyday events and emotions we all encounter that change our character in miraculous ways. One year, we decided to create our own story that would teach some of the principles we value most in life. The result is The Christmas Gift, the tale of a young man who, in his effort to stand up for the victim of a bully, becomes the bully’s new daily target. Eventually, having been humiliated and tormented beyond his limits, the young man lashes out and manages to cut to the core of the bully’s heart. While attaining near hero status in his school, he is troubled by his conscience. To the complete bewilderment of some around him, he decides to make an apology. What results is a unique relationship between these two most unlikely of friends. This friendship, built on understanding and forgiveness, becomes the rock upon which the two boys rely when faced with a crisis that will change them, and generations after them, forever. I hope The Christmas Gift will draw you closer to the ones you love and help you find others that may need your caring. May the miracles of the heart that spring forth at Christmas fill you all the year long. I hope that many of you will consider begging, borrowing, or buying The Christmas Gift. It is truly a treasure whose message is needed to be heard by all. Which Christmas books are "must reads" in your family each year? Do you have a favorite Christmas book of your own?